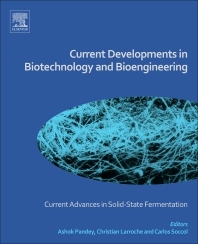 Current Developments in Biotechnology and Bioengineering: Current Advances in Solid-State Fermentation provides knowledge and information on solid-state fermentation involving the basics of microbiology, biochemistry, molecular biology, genetics and principles of genetic engineering, metabolic engineering and biochemical engineering. This volume of the series is on Solid-State fermentation (SSF), which would cover the basic and applied aspects of SSF processes, including engineering aspects such as design of bioreactors in SSF. The book offers a pool of knowledge on biochemical and microbiological aspects as well as chemical and biological engineering aspects of SSF to provide an integrated knowledge and version to the readers. Professor Christian Larroche is graduate in Biochemical Engineering from INSA, Toulouse, (1979), Docteur-Ingénieur in Organic Chemistry from Paul Sabatier Toulouse 3 University (1982), and Docteur ès Sciences (Ph D) in Biochemical Engineering from Blaise Pascal University (1990). He has strong research interest in the area of applied microbiology and biochemical engineering. His skills are related to the study and development of special processes for the use of microorganisms. This includes fungal spores production by solid state cultivation and their use as protein (enzyme) reservoir in biotransformations. A special interest in phase transfer phenomena coupled to metabolic engineering has to be noticed. It is applied to the design and optimisation of biotransformations involving hydrophobic compounds and carried out in biphasic liquid-liquid media. These processes are related both to the food and environment (bioremediation) areas. His interests have recently be extended to bioenergy, and he is presently co-ordinator of two French research programs on biohydrogen production by anaerobic microorganisms grown on complex media. He is author of about 150 documents including 70 research papers, two patents and 12 book chapters. He has supervised 10 PhD students and 20 MSc lab works. He is member of SFGP (French Society for Process Engineering) and Chief International Coordinator of ICBF Forum, an international network entitled "Food Bioprocessing - A global approach for advancing sustainable production of value added food". He is head of the department of "Study and Development of Processes involving Microorganisms" of the platform for technological development Biotechnology – Material Engineering of Blaise Pascal University and has in charge the team "Solid state fermentations – Biotransformations" of the Chemical and Biochemical Engineering Laboratory in the same university. He has been head of the Biological Engineering department of Polytech Clermont-Ferrand, a School of Engineering of Blaise Pascal University, from 2001 to 2011. He is director of Polytech since January 2012 and, since 2008, vice-president of the university in charge of research valorization and technology transfer.